Gaelic Football is an Irish team sport administered by the Gaelic Athletic Association (GAA). In essence the sport is a fast paced field game requiring skill, speed, intelligence, stamina, strength and passion. Don’t worry if you’re lacking in any of these, we’ll have no problem teaching you. Gaelic Football is a sport that is open to anybody, no matter what your skill set is. Gaelic Football is Ireland’s favorite sport, attracting more players than soccer and rugby. Despite its amateur status at all levels of the game, the final of the All-Ireland Champions attracts crowds of over 80,000 supporters. 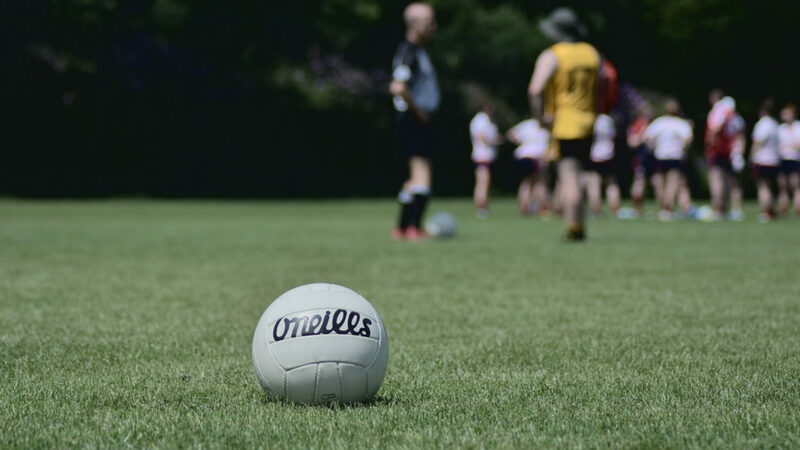 The ball used in Gaelic Football, is similar in size to a soccer ball, but is a lot heavier and harder. The game is played on a rectangular field, with goal posts very similar in shape to rugby posts. The difference in the posts is that the cross bar is lower, and we play with a goalkeeper, similar to soccer. The objective of the sport is to score by kicking or punching the ball into the other team’s goals (3 points) or between two upright posts above the goals and over the crossbar (1 point). The ball can be carried in the hand for up to four steps, and then must either be passed, bounced or solo-ed (an action of kicking the ball to yourself). Passes can be made by kicking or hand-passing (a striking motion with the hand or the fist). The ball can never be thrown. In the Men’s game the ball may not be touched with the hand when it is on the ground. You must pick the ball up by chipping it into the hands with your foot. The Ladies game has removed this requirement. In the traditional version of the game sport, the game is played over two halves for a duration of 70 minutes. Two opposing teams of 15 players each, line out with 1 goalkeeper, 6 defenders, 2 midfielders and 6 forwards. Scoring consists of putting the ball over the crossbar for 1 point, or below the crossbar into the net for a goal, which is worth 3 points. In Scandinavia, we play a condensed version with two halves lasting for 12.5 minutes each. Men’s teams line out with 11 players and ladies’ teams with 7. For a more visual description, check out the video below!